Taal’s ecotourism has received a big boost from the collaboration between Globe Telecom and the non-profit environmental organization Pusod, Inc. which are both working together to empower communities around the lake through environment education and sustainable enterprises. One of the key programs implemented by Globe and Pusod to address the area’s environmental issues is the promotion of ecotourism through the Taal Lake Conservation Center (TLCC) which gives a low-impact alternative to commercial tourism and promotes conservation of the ecosystem. As a result of the partnership, earnings of TLCC jumped by 1400 % . From revenues of only Php40,000 during its first year, TLCC registered an annual revenue of Php600,000 by end 2015. The facility was established by Pusod, in partnership with the Local Government of Mataasnakahoy and Taal Volcano Protected Landscape (TVPL) Protected Area Management Board, in 2011. TLCC serves as a knowledge hub for researches conducted in TVPL and operates the ecotourism program in partnership with Globe Citizenship. The program offers Community Walking Tours, Heritage Tours, Knowledge Tours to the Calawit side of the Volcano Island and other low impact water sports – Kayaking, Oz Goose Sailing, Stand Up Paddling. “We continue to find ways of cooperation to protect the environment and support sustainable livelihood and conservation, thereby, giving birth to our partnership with Pusod which shares the same environmental values as Globe. Through our joint efforts, we are able to create positive impact across the value chain -- from the community-based tour guides, boat operators, horse guides, local caterer, and community volunteers,” said Fernando Esguerra, Director of Globe Citizenship. “Lakes take a long time to respond to conservation measures. Those that are still connected deeply with the livelihood that the lake provides are less and less reliant on it. It prompted us to take action because a lot of people really depend on the lake for livelihood. The only way we can really save the lake is if they take pride in it,” said Atty. Ipat Luna , Executive Trustee and Founding Member of Pusod, Inc.
TLCC tours provide the least economic leakage as possible, ensuring that the local community benefit as tour and boat guides or food caterers. 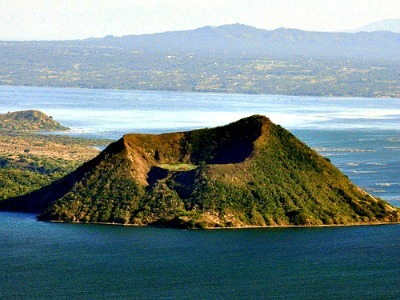 The tours include a full briefing on the lake region and eruption history of the volcano, a boat ride from Kinalaglagan, Mataasnakahoy to Calawit, Balete on Volcano Island and back, a horse ride or trek with a local guide, insurance, snacks and lunch of Batangas fusion cuisine and local refreshments, user fees and a conservation contribution. The tours also encourage visitors to engage in lake conservation. Aside from ecotourism initiatives, Globe was able to establish a monitoring system involving 5,000 fisherfolks of the Kilusan ng Maliliit na Mangingisda ng Lawa ng Taal through the TxtConnect facility, a web-based platform that enables them to broadcast messages critical to the implementation of the TVPL Management Plan. Globe also paved the way for mobile financial services to reach almost fisher folk communities across the 13 municipalities and three cities in Batangas and Cavite under the TVPL by distributing 5,000 SIM cards with discounted call and SMS rates.